Antique (Pre-1899) Rifles - Perc. Misc. Antique (Pre-1899) Rifles - Ctg. Misc. Antique (Pre-1899) Pistols - Ctg. Misc. Antique (Pre-1899) Pistols - Perc. Misc. Antique (Pre-1899) Shotguns - Misc. 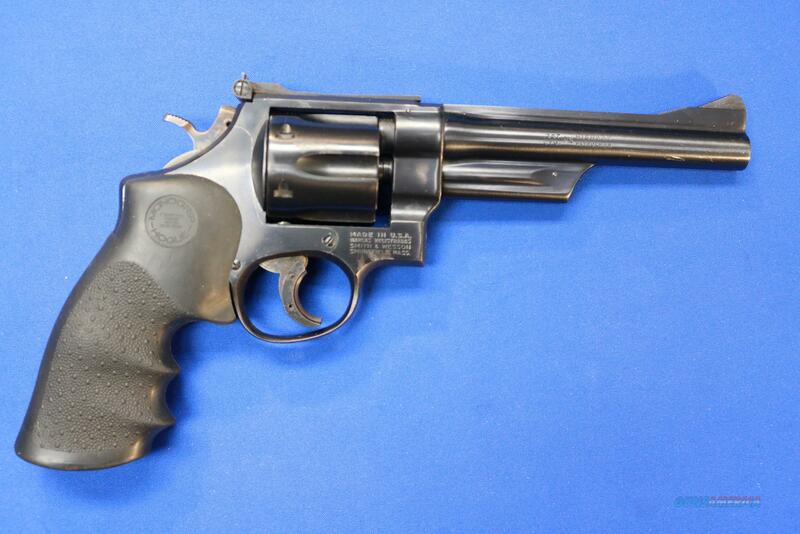 SMITH & WESSON 28-2 HIGHWAY PATROLMAN .357 MAG 6"
Description: On consignment we have a Smith & Wesson model 28-2 Highway Patrolman double action revolver in .357 Magnum. This revolver is the less expensive version of the Model 27, and features a matte blued N-frame with Hogue rubber grips, a 6-shot fluted cylinder, case colored hammer and trigger, and 6" barrel with adjustable sights. Gun shows some light wear, and is missing the original grips. This model is pinned and recessed, and also includes a trigger shoe, which can be easily removed. Serial number is N105329, manufactured in 1973. Please contact us with any questions, or for purchase options. We accept AmEx, VISA, MC, and Discover. All items ship fully insured. Item in photos is item you will receive. 1% Credit Card fee – minimum $10. We are Elk Castle Shooting Sports, Ft. Worth’s premier gun store and range, in business since 1947. Contact us at . Since we have a large retail space, all internet listings are subject to prior sale in store. We do make every effort to remove listings promptly if an item is no longer available. Conversely, once we receive email notification of a gun purchase online, we make it a priority to pull it from inventory so that it cannot be sold in store. Due to the additional costs of internet sales, shipping, etc., our internet pricing may vary from our In-Store price. In the case of multiple buyers for one item, customers will be given 24 hours to complete a transaction, after which firearms will be made available to the next buyer. RETURN POLICY: Elk Castle Shooting Sports will accept returns on firearms that arrive other than advertised in the listing. Returns MUST be left with the transferring dealer. If a customer takes possession of the firearm, Elk Castle considers this acceptance of the condition, and will not offer a return. Firearms returned for any reason other than damage or undisclosed conditions will be subject to a 10% restocking fee. TX residents add 8.25% sales tax. Be a GLOCK insider! Get the latest deals and be the first to know about new products, features and promotions directly from GLOCK. Sign up now! © 1997-2019 GunsAmerica.com LLC All rights Reserved.